Mr Zi Zhou Zhou passed away peacefully on 29 May 2015. 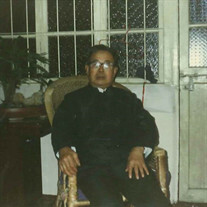 Beloved husband of Shu Ying Chen. Adored mother of Min Kun Zhou, Su Zhen Zhou, Su Ling Zhou and Min Kang Zhou. The family of Mr Zi Zhou Zhou created this Life Tributes page to make it easy to share your memories.